Sixteen-year-old Tatum Elsea is bracing for the worst summer of her life. After being falsely accused of a crime, she’s stuck under stepmother-imposed house arrest and her BFF’s gone ghost. Tatum fills her newfound free time with community service by day and working at her covert graphic design business at night (which includes trading emails with a cute cello-playing client). When Tatum discovers she’s not the only one in the house keeping secrets, she finds she has the chance to make amends with her family and friends. Equipped with a new perspective, and assisted by her feisty step-abuela-slash-fairy-godmother, Tatum is ready to start fresh and maybe even get her happy ending along the way. I was surprised by this book many times. At first I thought it would be an angsty “woe is me” book. Then I was like ahhh something horrible is going to happen towards the end and it will ruin my ship. But none of my theories or guesses happened (except for who Shay was). We start of at the Police station. Tatum, her friend Ashley, and Ashley’s boyfriend are arrested. Why are they arrested? Because Ashley’s bae decided to steal a whole bunch of smartphones. Now Tatum is stuck with a fine and community service even though she knew nothing of what Ashley and her bf had planned on doing that day they went to the mall. She was in the wrong place at the wrong time. The story progresses as Tate struggles with being under house arrest under her stepmother’s watchful eye. Her stepmother Belen is very harsh on her and her step sister Tilly hardly acknowledges her existence. To make things worse, her father goes out of the country so she is left alone with her step-family. Throughout the entire book, Tate learns that the people closest to you can disappoint you, that making new friends may not be as bad as she thought it would be, that forgiving others is always good even though it takes time for the person you forgive to realize their mistake (Yes, I am talking about Ashley) and that you shouldn’t judge others, especially if you haven’t taken the time to properly get to know them (Her stepmother Belen and her stepsister Tilly). My favorite character’s were Abby (Her new friend and journalistic wiz) and Blanche (Belen’s mother, Tilly’s grandmother). They both brought humor and the reality check that Tate needed. They were great support systems, yet they didn’t baby Tate. Loved this! Overall, It Started With Goodbye, is a solid debut. I will keep a lookout for Christina June’s next novel. Disclaimer: I’d like to thank Blink/Harper Collins for providing me with an ARC of this novel. Receiving this novel for free does not sway my review. Lola Nolan is a budding costume designer, and for her, the more outrageous, sparkly, and fun the outfit, the better. And everything is pretty perfect in her life (right down to her hot rocker boyfriend) until the Bell twins, Calliope and Cricket, return to the neighborhood. When Cricket, a gifted inventor, steps out from his twin sister’s shadow and back into Lola’s life, she must finally reconcile a lifetime of feelings for the boy next door. So I’m not exactly sure why but I LOVED Lola and the Boy Next Door waaaaaaaay more than the first time I read it about 5 years ago. I remember being annoyed by Lola the entire time. This time around though I’m not sure what changed, but I was able to empathize with her. And I also think Cricket is part of the reason I like Lola and the Boy Next Door now. As I am sitting here trying to gather my thoughts, and the one thing that stood out to me this time was the theme of forgiveness. Lola has to forgive the Bell twins, her biological mother, and her musician boyfriend (who becomes the ex thankfully because he sucked). The entire book is a journey of looking at the mistakes that were made, and finding redemption through forgiveness and understanding. We also see the theme of second chances. Lola gave both her mother and Cricket a second chance. Having your heart-broken by two of the most important people hurts, but if both parties are willing to put in effort, relationships can be restored. I was very into my feelings as I read Lola this time, and it could be why it’s gone on my “You should read this book” list (and why this review turned deep. Sorry guys, no fangirling today). From the first moment that How to Make a Wish was announced I was incredibly excited to read it. I had read Suffer Love by Ashley Herring Blake and fell in love with her writing style and story telling. 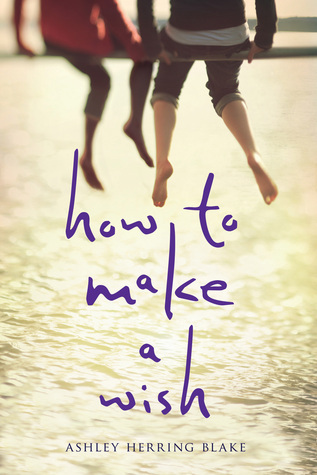 And while this review is coming out on the day How to Make a Wish is published, I read this novel over two months ago when I received the ARC. How to Make a Wish grabbed me from the first sentence. A story of loss, love, acceptance, and future, Ashley weaves an intense tale of two teen girls finding each other at the right moment. Of complex stories that intertwine. Of having to handle that moment of “coming-out” to her family and friends. I like both character’s right away and their “meet cute” was the perfect way to start their relationship. With Grace launched into the adult world too soon, having to take care of a mother who is unpredictable, she is resentful that she doesn’t get a normal childhood. She is also looking toward her future, thinking about college, worried about her mother, worried about her best friend, feeling helpless. She is a very well-rounded character. Eva on the other side is suffering the death of her mother and mentor. Forced to move to a town and in with a family she doesn’t know. Finding connection with Grace’s erratic mother. On a deep scale, this book is about relationships; coming to terms with who an individual is, who a person wants to be, acceptance, love, friendship. I’d like to thank Houghton Mifflin Harcourt Children’s Book Group for providing me with an ARC of this novel. Receiving this novel for free does not sway my review. 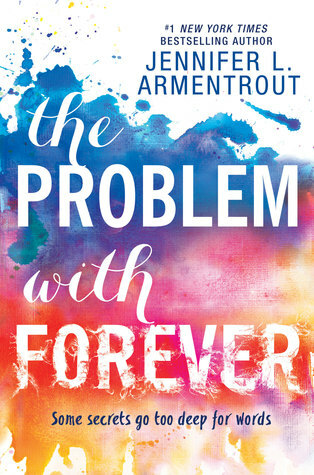 Something I have always loved about Jennifer L. Armentrout is her ability to take mental illness and weave them realistically into lives of her characters. Having seen her a few times in person, she is incredibly passionate about mental illness and being true to them when writing stories. She has previously written two other stories about mental illness, both of which I loved- Scorched and Frigid. The Problem with Forever is about a Malory who grew up in the foster care system with abusive foster parents. She shared that home with a boy- Rider- whom was like a protector. Eventually Mallory is adopted by a new family, but she still has to deal with the after affects of the abuse and foster care system. Mallory and Rider are both complex characters, each with their own coping mechanisms. The importance of this story is the acknowledgement of these complexities and how their family and friends supported them, but also how they supported each other. This novel also sheds light on old “don’t judge a book by it’s cover” idea. All people come from different backgrounds, and, especially given today’s issues, it’s important to not judge before knowing someone. This series continues to get better and better. Mass’ writing has evolved over time and Empire of Storms is at the top. 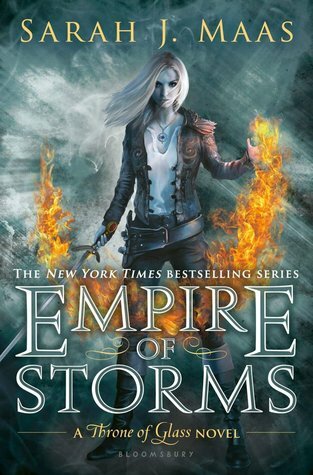 As the second to last novel (that we know about because last year we received exciting news about novellas), Empire of Storms picks up right where Queen of Shadows finished. Between the first and the fourth book, Celaena Sardothian has evolved into her true self, Aelin Galathynius. She has used everything she went through to become the true Queen of Terrasen. And in EOS, Aelin must now gather her army and prove she is more than her enemy. Old friends come back and new faces appear. EoS is a continuous adventure, switching perspectives of several different characters. We learn new back stories. Discover devious plots. Hearts change. Maas weaves secret after secret through the pages and when events happen, it usually blew my mind. And the end completely threw me for a loop. I didn’t see any of it coming. I would put Sarah J Maas in the same story telling category as JK Rowling and JRR Tolkien. She is a story teller, a world builder. The Bad Boy Bargain exceeded my expectations. I was expecting for Kyle to be an actual bad boy, not a “fake” bad boy. To think he was the complete opposite of the persona he put off just so he could cruise through high school without having to be bullied or sought after for the wrong reasons is heart-breaking and made him more adorable. Faith is a whole other story. She is Ms. goody two shoes who seems to be dating doochebags all the time. Especially this last one, Cameron, is a real piece of work. And the thing is that Cameron and Kyle have some unfinished business so when Cameron cheats on Faith and Faith breaks up with him, she decides to get revenge by going out with the notorious bad boy Kyle. The Bay Boy Bargain is a story that deals with the pains of teenage life. It shows how one small action can change your school life. To us who are older it may seem silly that it’s so life or death per say in the teenager world, but we all know that in that point of our lives it feels like life or death. I’d like to thank Entangled Publishing for providing me with an ARC. Receiving this ARC for free does not influence my opinion in any way. I’ve become an expert at avoiding things that could hurt me—which means I will figure out how to stay away from Marco Leone. I received this book through Miss Print‘s ARC Adoption Program. And I have to say when I received it I was so excited to read it. The synopsis sounded amazing and I know Kami Garcia is a fantastic writer. Her Beautiful Creatures series is just that, beautiful. But as you can see I haven’t posted a review in a while. There have been many changes in my personal life, ups and downs, that have lead to me reading less. And while these changes were occurring, I was reading The Lovely Reckless. So my feelings on this book, I think, are a bit biased because of my personal life. 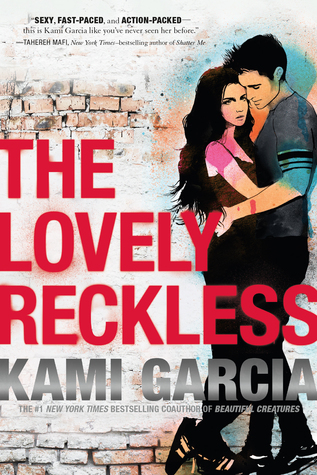 I do have to say The Lovely Reckless was enjoyable, but not as enjoyable as other contemporary books have been for me. I enjoyed Frankie’s character growth over the course of the novel, but I felt disconnected from her. I also had a difficult time with the Frankie/Marco instalove story. It felt a little like Romeo and Juliet? I guess when you’re that young (I am 28) and you have stopped caring about life and people, instalove does happen. But I felt disconnected with that too. I did enjoy the background characters more, though I was disappointed with how lacking the parent existence was as well as Frankie’s attitude toward them when she did speak to them. Lexi was funny and I really enjoyed how loyal she was to Frankie. Cruz was super cute. But overall the story just felt lacking. And again I think, due to personal circumstances, I liked this book less than I would have at another time. Due to this I did not finish it. And I hate DNFing a book. There have been few books that I’ve done that to and it guts me. Don’t let my attitude toward this book stop you from reading it. I know so many people who enjoyed it immensely. Thank you to Miss Print and her ARC adoptions for the opportunity to read this novel. Receiving this novel for free doesn’t sway my opinion.